I’m the type of girl who’s got to have her breakfast. Without it, I get cranky from hunger and wobbly from lack of energy… I can’t possibly be much fun to deal with. (Poor Son, he has to deal with me every time I don’t get breakfast! Thankfully not often…) Lucky for me, I’ve got a darling boyfriend who will look up places we can go find breakfast while we’re on vacation. I’m such a lucky girl to have him. On the Tuesday while we were in Hawaii, we had decided to go to the botanical gardens on the east side of the island of Oahu, and then head to the Byodo-In temple afterwards. (We didn’t make it to the temple until later in the week, but only because we managed to miss the turn-off… oops! Found some nice beaches and awesome tide-pools though, so it was a worthwhile mistake.) 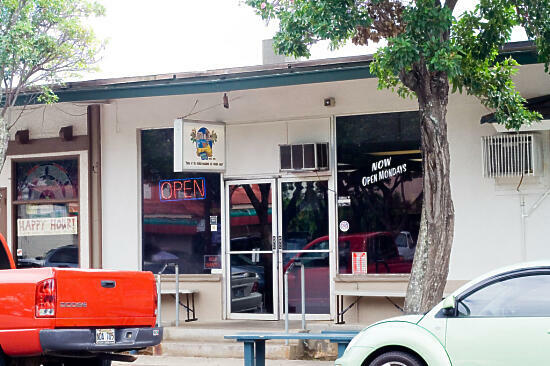 Since we were going to be in the Kailua area anyways, we decided to head over to Boots & Kimo’s Homestyle Kitchen. They are famous for their pancakes with macadamia sauce, so we figured it would be hard to go wrong there. We ordered the pancakes with macadamia sauce of course, and also a spam omelet. We had hoped to try their fried rice as well, but they were unfortunately out of it by the time we got there. 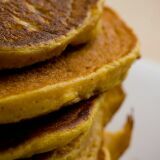 The pancakes were amazing – it’s not difficult to see why they are known for their pancakes! The flapjacks were sweet, soft, moist… really nothing I could find wrong with these. 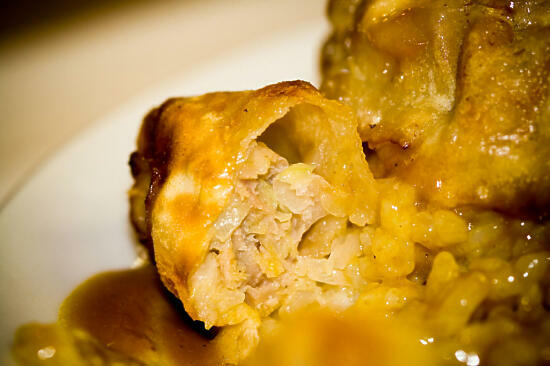 I believe three or four came stacked on a plate and smothered with the macadamia nut sauce. The sauce… delicious. 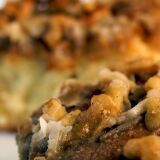 Sweet but not overpowering, with a definite macadamia nut flavor. The spam omelet was delicious as well. As I’ve mentioned before, I grew up with spam scrambled with eggs, so this was a pleasant blast to the past. The omelet also contained cheese, which made it just a wee bit too rich. Son and I shared an order of pancakes and the omelet (which came with a side of hash browns), and we were unable to finish all the food. Just a bit too much for us. 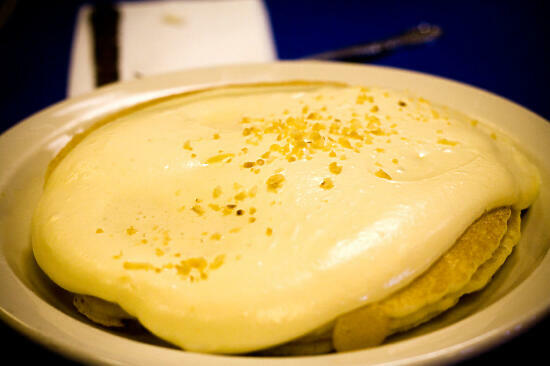 If for nothing else, go to Boot’s & Kimo’s for their pancakes… it’s entirely worth the trip. 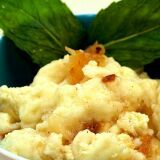 Note: To all TWD visitors, so sorry I can’t post the creme brulee quite yet! My local grocery store had a power outage, so the dairy shelves were next to empty. No whole milk or heavy cream means no creme brulee for me. 🙁 I’ll be posting as soon as I can get the ingredients, I promise! Like many Japanese-Americans, I grew up eating ramen since I was very young. Although we always used the instant ramen, she often made it Japanese-style, accompanying the ramen with a hard-boiled egg or a few slices of cha shu. Of course, like most “starving college students,” I ate a lot of ramen throughout college, and my pantry is never without a few packages of instant ramen. Yet even with all this ramen I ate, I have never been to a ramen house. Never, until now. 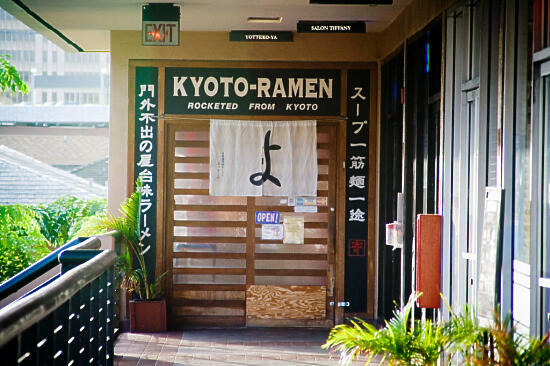 Yotteko-Ya is known for their cha shu ramen, so I knew we would have to try that here in Hawaii. Son and I decided to visit on Monday night, after a day of visiting the tiny aquarium and walking along the beach near our hotel. The restaurant is very quaint. If I didn’t know better, I would have thought we were walking into a little ramen house in Japan’s countryside. From the moment you see the door, the place looks very traditional. Inside, the illusion is only marred by the view of a Taco Bell right outside the window. When Son and I go to restaurants, more often than not we eat family-style. (Actually, I can’t think of the last time we didn’t eat family-style.) We always order two or three dishes, and then share everything so we get to try more types of food. At Yotteko-Ya, we decided to get the Garlic Chahan (pork fried rice with minced garlic, topped with garlic chips), Gyoza, and the Kakuni Paitan Ramen (ramen in a rich broth, topped with a block of chashu). The gyoza… *shrugs*… nothing special. The garlic chahan was good… Son, who adores anything garlic, loved it. I liked the pork scattered throughout and the fried garlic chips on the top, but while I enjoyed it, the rice wasn’t anywhere close to my favorite meal of the night. 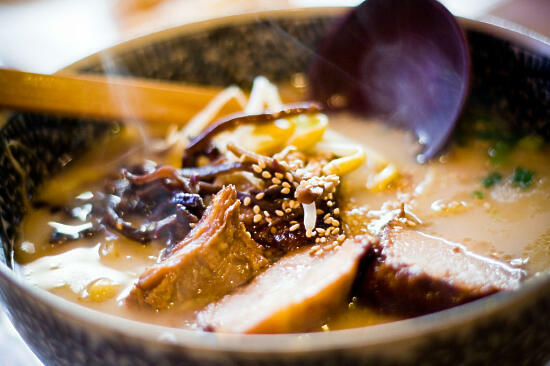 But the ramen… oh my gosh the ramen! 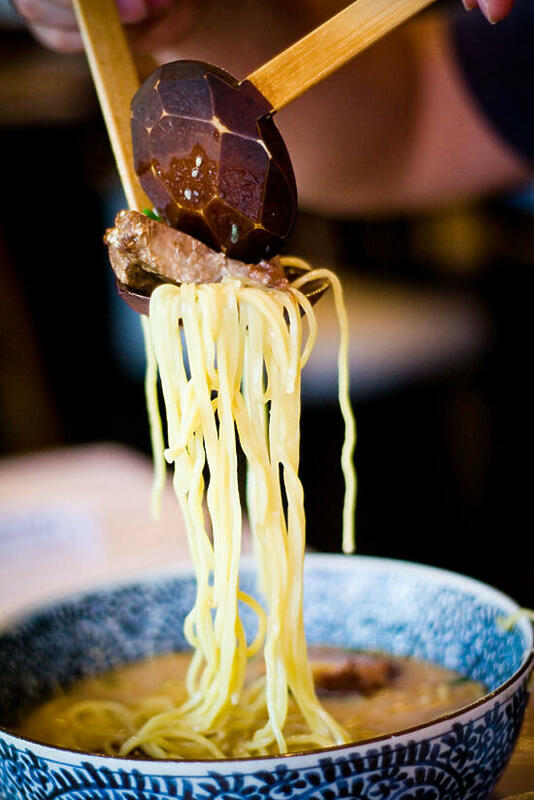 Thick, rich broth in which just al dente noodles floated, pieces of chashu so tender they would fall apart in your mouth. Oh. My. God. I don’t know what I’ve been thinking all my life, but I must find a ramen house this delicious back home. I’m considering going out for ramen every day for the next year to make up for the years of the instant stuff. I’m kidding of course, no way could my budget afford going out for ramen every day. But seriously people, instant ramen? Doesn’t even compare. The line outside the curry house. Can you spot me? Until several years ago, I had never eaten curry. No Indian curry, no Vietnamese curry, no Japanese curry. To me, curry was a scary food – too spicy, weird flavors. Or at least, that’s what I thought… I hadn’t ever had a taste, so how could I know? 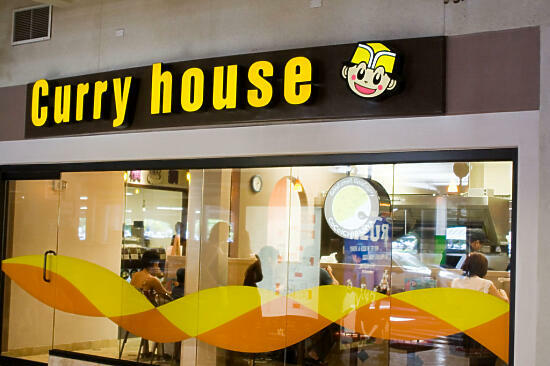 One weekend, Son and his friends decided to go to a Japanese curry house. I reluctantly went along and shared a plate of curry with him. Unfortunately, I wasn’t yet convinced that curry was a food I could love. 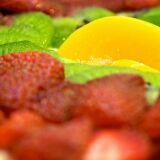 It wasn’t until several years later, when my tastes had widened considerably, that I fell in love with the food. Now I’ll go out of my way to eat or make curry – whether it be Vietnamese curry, Indian curry, or especially Japanese curry. 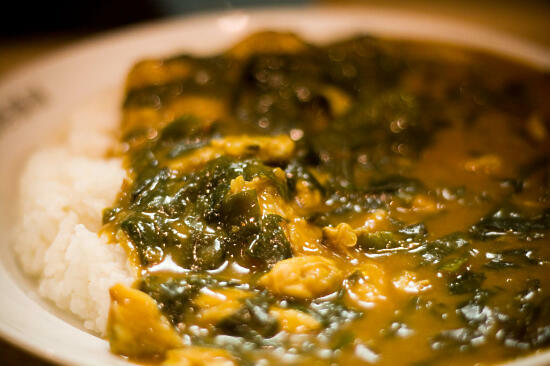 When I looked up restaurants to try over here in Hawaii, the Coco Ichibanya Curry House was one that jumped out at me. 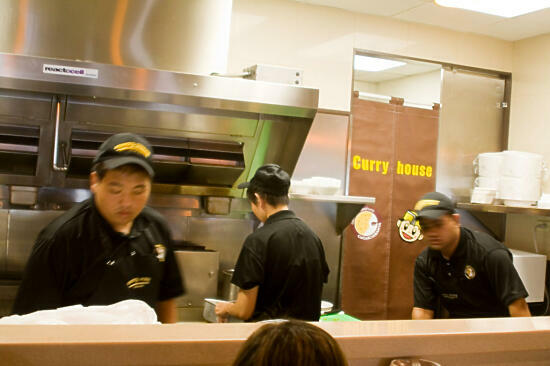 It is a small Japanese curry house, which got rave reviews on Yelp. After spending the morning at Pearl Harbor (where it rained on us! Bah. It’s not supposed to rain in Hawaii! ), we decided curry was in order. Oh man, we are not regretting that decision one bit. 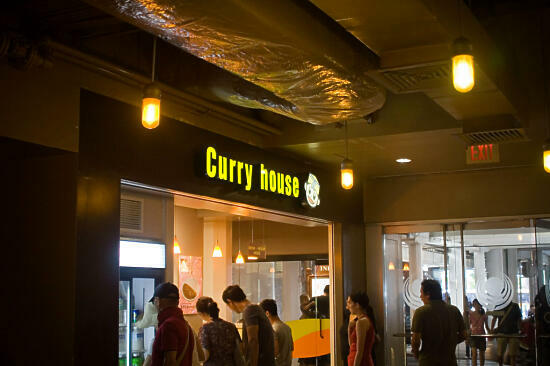 We went to the Ala Moana Center to find the curry house. It’s at the edge of a food court, so at first you’re not sure if it’s the right place. Very small, it does have a tiny counter to eat at – I recommend trying to get a seat at the counter, because the rest of the food court was packed the entire time we were there. The counter was not crowded at all, and you got to watch the cooks preparing the food right in front of you. Son got the spicy clam and wakame curry, while I got the fried chicken and gyoza curry. 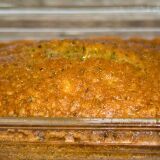 Son adored his spicy, savory, flavorful curry – he got very close to licking the plate clean. 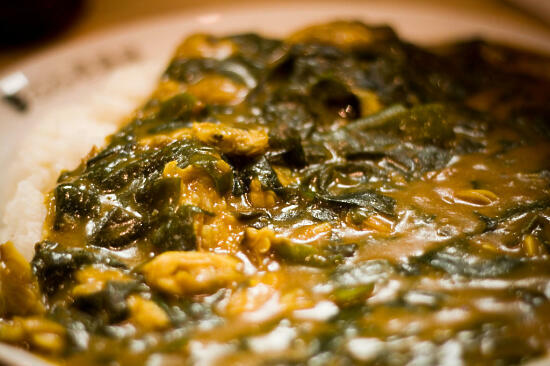 For seafood lovers, he highly recommends this curry. Unfortunately, I don’t have nearly the stomach capacity that he has. I barely managed to down half of my plate before declaring the rest would be tomorrow’s breakfast. 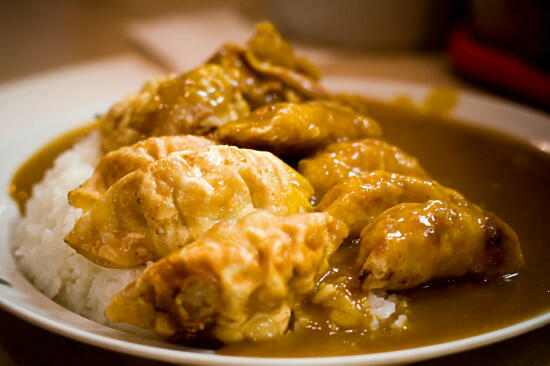 The gyoza was amazingly good – curry goes extremely well with crispy foods. I easily finished all of the gyoza. 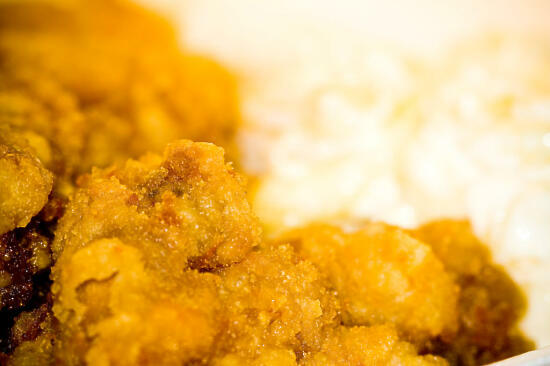 The fried chicken… not something I’d get again. It seemed bland… the curry was still delicious, but I definitely preferred the gyoza. There is only one thing I can’t stand about the curry house. They only have restaurants in Hawaii! That means that back in California… no Coco Ichibanya Curry House for me. Sad indeed. After lunch: a nap, a walk along the beach, and then an amazing dinner! Want to read about our dinner? See my post on Sushi Day. I hate five hour plane flights. Actually, we might have been in that plane for six hours or more… I’m not sure. My legs were cramping, my joints were aching, and I had a murderous headache. We got lost a few times, and quite frankly, I wanted nothing more than to get back to the hotel and go to sleep. Good food makes everything better. On our way from the airport to the hotel, we stopped by a place called Sugoi. 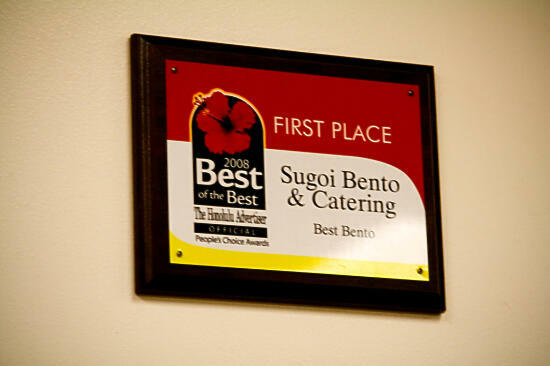 When I had researched restaurants to visit before we left, I had read that Sugoi is known for it’s garlic chicken. 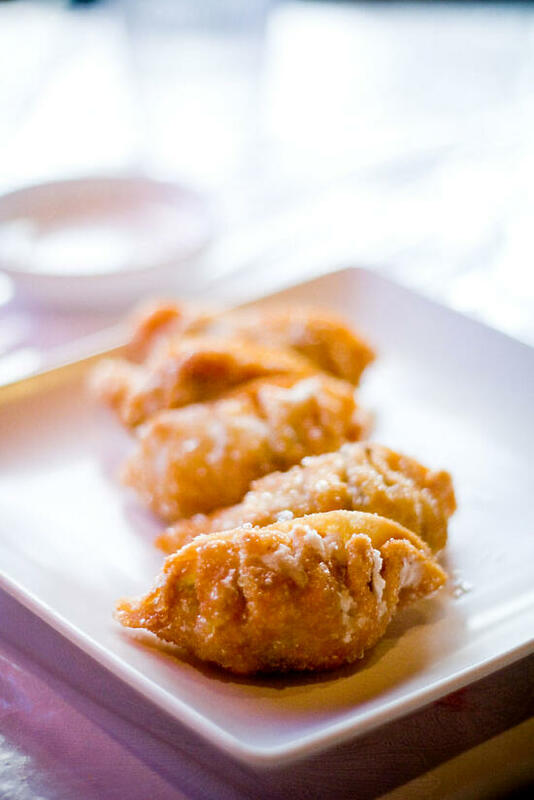 Heck, if a restaurant is known for something, and it involves garlic… we’re definitely getting it. Son, well, he’s been known to eat garlic raw. He adores garlic, in any form. 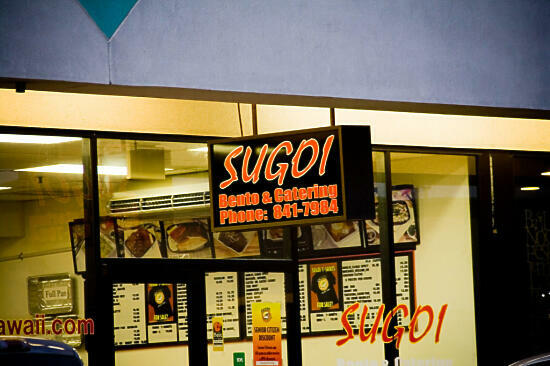 If you’re ever in Honolulu, go to Sugoi, and get the garlic chicken. I’m not kidding. This stuff is amazing. It’s as if the chicken has been fried to a crisp, and then drenched in this sweet, garlicky sauce… but it’s still crispy. We both stuffed ourselves to the max. However… don’t get the teri beef plate. The beef is dry, severely lacking any sort of sauce (no “teri” at all!) and looked super-processed. Definitely not recommended. Update: We went back there for our last meal in Hawaii, because we really can’t get enough of that amazing garlic chicken. 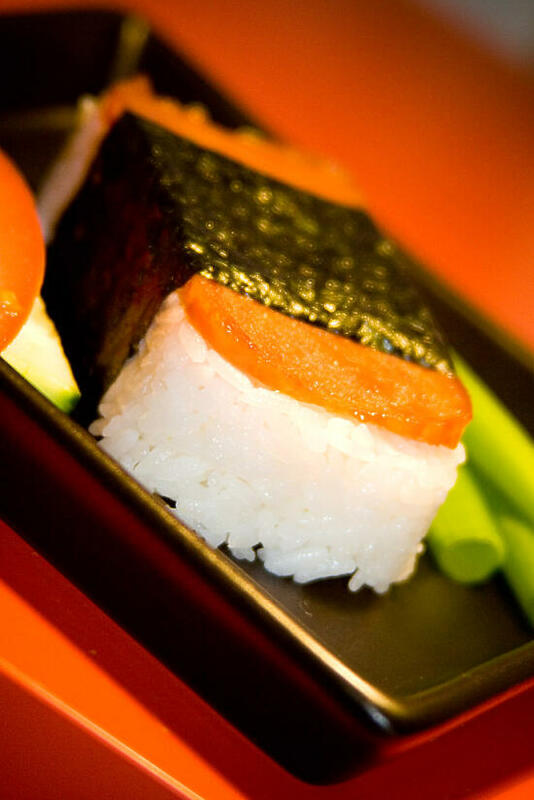 Another good one to get: misoyaki butterfish. This is Son’s new addiction… he got it as often as he could in Hawaii, and is now searching to find it in CA. 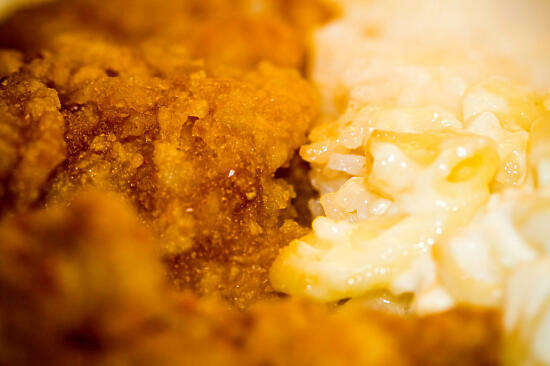 Also, there’s another place that’s supposed to have good garlic chicken, called Mitsu-Ken. Nope. Not even close to Sugoi. 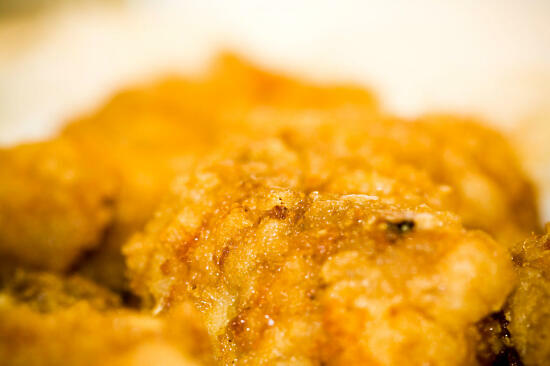 Mitsu-Ken’s garlic chicken was rather dry, where Sugoi’s garlic chicken was oh so moist and juicy, yet still crispy. *drool* I’m serious, don’t even bother with Mitsu-Ken. Sugoi, all the way. Every now and then, it’s good to take a vacation. A time to relax and put all your worries aside for a week. Generally, it’s recommended that you take a vacation once or twice a year. Of course as with many things in life, things can get in the way of this – work, school, family, or life in general. However if you let yourself go to long without a good vacation, there can be negative effects. Stress, burning out, even sickness can occur when you work non-stop for long periods of time. The last time I have gotten any significant break was in the spring of 2005 – I took a leave of absence for the Spring quarter of my freshman year in college. However, even this wasn’t much of a break – I was bedridden for much of the time, and in some ways this was even more stressful than being in school. (Another story for another time.) Since then, I’ve taken a full load of classes every quarter – even summers. Since graduating three months ago, I have been working non-stop, so there haven’t been any breaks for me. But where, you might ask, am I going? Hawaii. 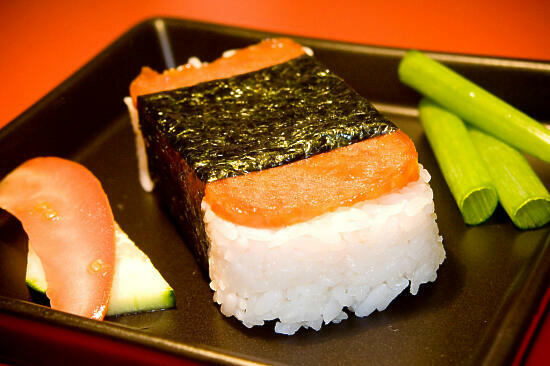 The land of spam musubi (and, I’m sure, plenty of other amazing food.) 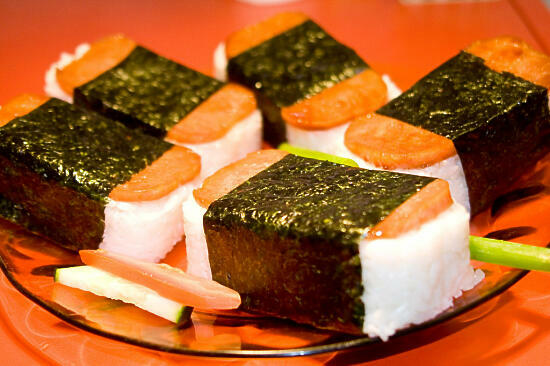 Thus I leave you with my recipe for spam musubi… although I’m sure in Hawaii they’ll show me how it’s *really* done. Place the spam in the shoyu mix, marinate for about 5 minutes. 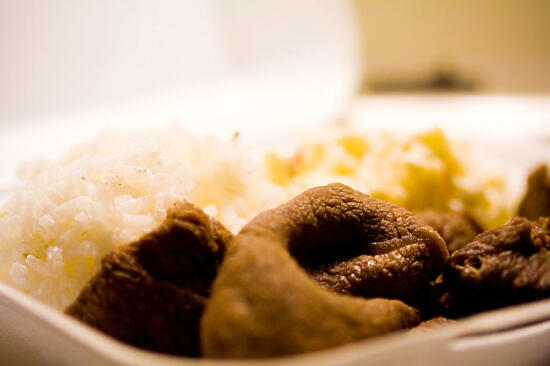 Fill the can loosely with rice, then pack the rice into the can very tightly. It should end up about an inch or so thick. To get the rice out of the can, I slammed the can upside down on the cutting board until the rice came out. You might also try to line the can with plastic wrap before you pack the rice, so it’s easy to pull it out. By the way, we’ll be staying on Oahu. Any must-visit restaurants that you would recommend?